There were two ways it could go, really, bringing a man with Peter Molyneux’s reputation in to help judge Make Something Unreal. The Peter of the popular imagination would leave the final four teams scrambling for pens, I imagined, scrawling a torrent of new ideas on nearby desks, walls, faces. He’d swamp their polished, six-month genetics-themed demos with suggested new features – a real-time egg-hatching system there, a whispering genome there. In reality, of course, he sat in studious attention as the exhausted students rattled through their final presentations, asking the odd question, before secreting himself in some corner of the hall to deliberate with today’s judges. As we waited, and waited, I heard one Epic staffer explain that we’d know the winners just as soon as the judges themselves knew, “like the Pope”. And, eventually, we did. About four hours earlier, I made my final circuit of the teams to get updates on their work. They were noticeably jittery, and I spent much of the morning batting away questions about their competitors’ progress. About four hours later, Epic Games’ man in Europe returned from whatever cove the judges had been smuggled away to. There were no smoke signals; no scrolls unfurled. Just four names, read out by Mike Gamble in reverse order. “I would like to say that whilst you are fourth, that really doesn’t reflect badly at all,” said Gamble. “The game you have is very, very different, not a typical Unreal-powered game and for that we are very thankful, because you push the technology in ways that are unusual. “It’s been a very hard decision,” admitted Gamble. “You’ve got a game there that is unique amongst games generally. You’ve got a sense of fun and whimsy that is unusual, and an art style that is fantastic. Said Gamble: “You guys have a game there which you know is very commercial, and you’ve been told is very commercial. You can finish and publish that game in a variety of ways and you have the licensing to do that now, which gives you a very strong bargaining position. So don’t be downhearted. I expected to find four good games when I arrived at the Gadget Show early this week. What I didn’t expect were the four teams behind them – every bit as professional, in their drive, their behaviour, and their abilities, as the established studios they seek to emulate. Any one of them could set up shop tomorrow. For now, though, these students will do as they always have. They are second year undergrads, for the most part, and many have long-neglected assignments to work on. Of the four teams, at least two will stick together. One or two, I suspect, will break into their constituent parts to make their respective ways into the games industry as individuals. But you should look for all of them on Steam, in the credits of the games you play, and in the articles on this site. 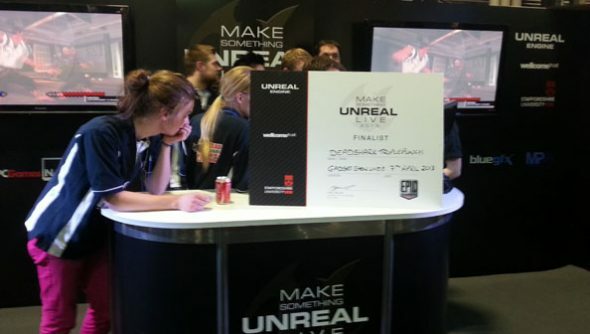 For all of this week’s coverage from the Gadget Show floor, check the Make Something Unreal Live tag.